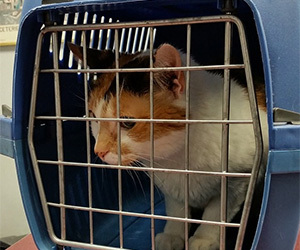 Teaching your cat to feel secure and comfortable in his crate can make it easier to entice him into it when you need to transport him somewhere, like the veterinarian’s office. But your cat’s crate can be useful for more than just taking him on the road; crate training can provide a retreat for your cat in unfamiliar or stressful situations. Unfortunately, many cats fear the crate or associate it with negative things. For these cats, a crate is more like a portable prison than a personal getaway. In fact, the mere sight of the crate can become a cue that something bad is likely to happen, which can lead to a feline freak out — and make getting your kitty into his crate nearly impossible. The good news is that with just a little patience, most cats can be trained to love the crate. Here are my tips for making the crate your cat’s happy place. If you want your cat to love his crate, then you need to start with the right design. My favorite crates have removable tops and at least two exit points. This is important because one exit point may be easier to access than another, depending on how your cat is positioned in the crate when you get to your destination. A crates with a removable top also allows your veterinarian to examine your cat without removing him from the crate; this can reduce your cat’s anxiety and make trips to the vet less stressful for him — and you. Choosing the right crate is only the first step, though; you need to create a comfortable environment inside the crate. Make a soft nest with plush bedding or blankets with the cat’s familiar scent on the bottom of the crate, and consider spritzing Feliway, a pheromone spray, inside the crate to help calm your kitty. When carrying the crate, lift it evenly on both sides, rather than grabbing it by the handle, and carry it gently, as if it were a breakable present. You may also want to cover the crate with a towel or blanket to reduce visual stimuli, which can be stressful for your cat. Finally, be aware that forcibly pulling your cat out of his crate can scare him. Instead, open the door or remove the top and ignore the cat until he comes out on his own, or lure him out with food, petting and play. Once you’ve got the right crate, it’s time to teach yourcat that it is his own private kingdom. The following strategies can be used on their own or in combination to make the crate appealing to your kitty. Leave a Hansel and Gretel-like trail of your cat’s favorite treats leading up to and inside of the crate, or serve your cat’s meals inside. Leave the door open during the training stages to reduce his fear of being trapped. If your cat is initially reluctant to eat inside the carrier, start by placing treats or his food bowl as close as possible to the door of the carrier (but make sure it’s far enough away that he’s still willing to approach the food and eat — this may be a couple of inches or a couple of feet, depending on the cat). At each feeding, move the food bowl closer to the crate; go slowly and make sure your cat remains comfortable with the change. Once your nervous kitty begins to venture inside his crate, remove the top; leave it off until he’s comfortable eating a snack or meal inside the base of the crate. Your cat’s crate should be a place where good things happen. Offer your cat a special toy or treat, like a stuffed kitty Kong, when he’s in his crate. Once he is relaxed and engaged with his toy, shut the door for a couple of minutes; reopen it before he loses interest in his treat. Gradually increase the amount of time you leave the door closed. If your cat acts nervous when the door is shut, keep intervals short: Close the door for a couple of seconds, drop a treat into the crate while the door is closed, then open the door. Slowly increase the amount of time you leave the door closed. It can be a struggle to get a panicked cat into a crate. Counter this by teaching your cat to go inside his crate willingly. There are several ways to do this: A cat can be trained to follow a target stick or hand target into a crate, or a treat or toy can be used to lure the cat into the crate. Whatever approach you choose, the key to getting your cat to go into his crate when asked is to pair a verbal cue or hand signal with the lure, to indicate that the cat will be rewarded when he goes into his crate. For instance, say the word “crate” and immediately place your cat’s food bowl inside the crate; over time, he will come to associate the cue with his dinner. Instead of storing your cat’s crate in the attic between vet visits, leave it out and treat it as fun, friendly furniture. This encourages the cat to get familiar and comfortable with the sight of it and helps counteract bad or stressful associations he may have formed. Randomly drop treats, new toys or other goodies inside the crate during the day, even when your cat isn’t around. This will entice him to explore the crate to see what fun awaits inside. Especially affectionate cats can be petted while they sit in their crates, making it a go-to spot for attention.